Randy McKenzie, operatons chief, points out the outline of the West Garcon fire. 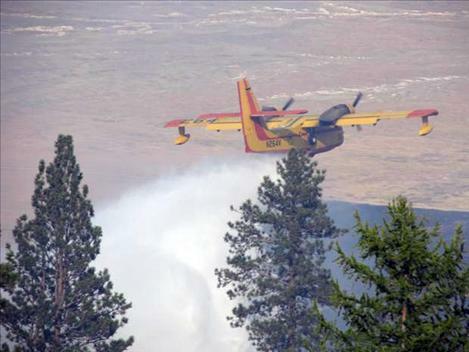 A CL 215 scooper plane dumps water on the West Garcon fire. 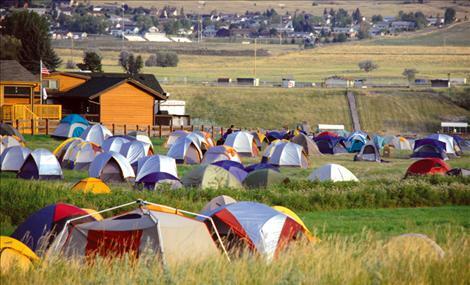 Firefighters sleep in a tent city at the Polson Fairgrounds. 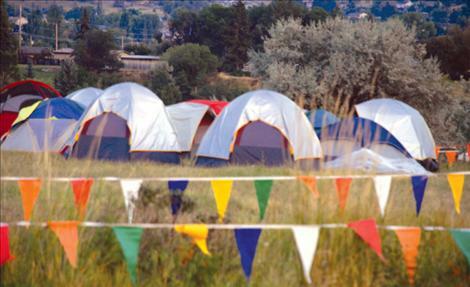 POLSON — With critical air support, firefighting crews and equipment, the 9,863-acre West Garcon fire was fully contained on Aug. 24, according to public information officer Jennifer Costich. 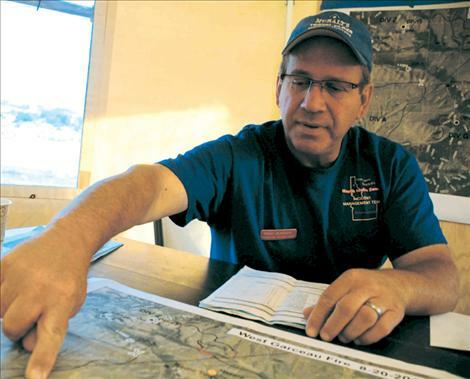 With containment achieved, Rick Kusicko’s Type 2 Incident Management Team returned management of the West Garcon fire to the Confederated Salish and Kootenai Tribes Division of Fire on Sunday, Aug. 26, said Curtiss Matt, Division of Fire information officer. Local fire crews will continue patrolling the fire. Hotspots and islands of unburned fuels in the middle of the fire could continue to smolder and burn for the next couple of weeks. The West Garcon fire began on Aug. 13 at approximately 5:48 p.m. Local fire departments and the CSKT Division of Fire fought the blaze all night and saved homes. Beginning as a small fire, the West Garcon burned 300 to 500 acres of grassland and trees and then ballooned to 1,341 when winds up to 30 mph gusted through the area. More than 300 crew members fought the fire, located about 20 miles northwest of Ronan. With the fire burning 60 percent grass and 40 percent trees, local ranchers lost winter grazing, a few haystacks, fences and a couple of outbuildings. No lives or homes were lost. The cause of the fire is still under investigation. With the West Garcon fire contained, Matt noted the Vanderburg fire, 20 miles southwest of Arlee, also remains on patrol status. The Division of Fire is also investigating a fire reported Monday, Aug. 27, that’s burning east of Gray Wolf Casino in Evaro.